Devine Mischief and jockey Luis Contreras, capture the $100,000 Ruling Angel stakes at Woodbbine for owner Breeze Easy LLC and trainer Joe Sharp. Devine Mischief, the first Canadian starter for trainer Joe Sharp, was up in the last jump to edge out Glamanation and Jean Elizabeth in a thrilling three-horse conclusion to Woodbine's 6 1/2 furlong Ruling Angel Stakes on Sunday. “I got a really good trip,” said Contreras, who was riding Devine Mischief for the first time and recording his eighth stakes win of the meeting. “I saved all the ground in the turn and once I turned for home, I found my way to the side and I'm glad I got it done at the end. Devine Mischief, a Kentucky-bred who races for Breeze Easy LLC and has been training in her home state, was winning for the fourth time in eight starts. The daughter of Into Mischief had placed in Belmont's listed six-furlong Jersey Girl this June but was coming off an eighth-place finish over a sloppy surface in the seven-furlong Dogwood at Churchill Downs. 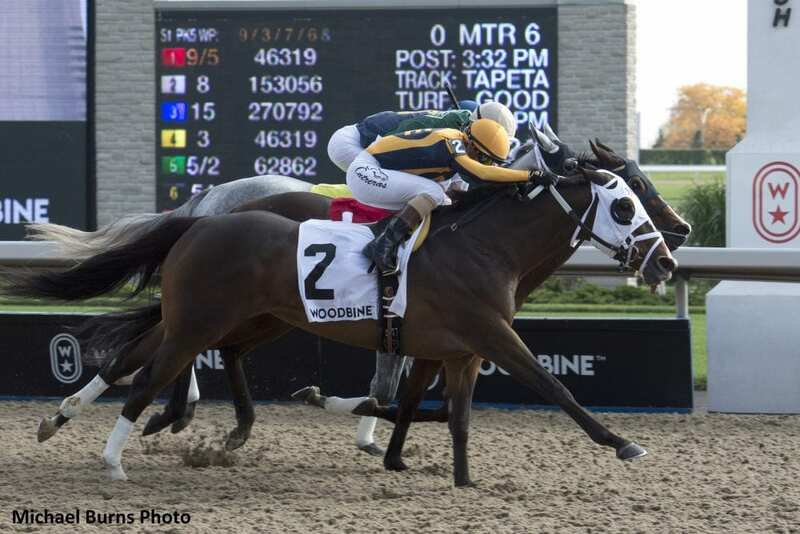 This entry was posted in Racing and tagged devine mischief, glamanation, jean elizabeth, Joe Sharp, Luis Contreras, ruling angel, ruling angel stakes, woodbine, woodbine racetrack by Woodbine Communications Office. Bookmark the permalink.